As I mentioned in last year’s review of El Rodeo, there’s a certain challenge in finding good Mexican places in Northern New England. We don’t get a lot of Mexican (or even Latin American) people moving north of Boston, and when they do, the local tastes up here tend to cause them to water them down the spicing level and amp up the queso factor a bit. 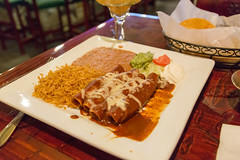 So when I’m traveling around and see a Mexican place I haven’t tried yet, I’m usually skeptical, but when I spotted El Colima in Nashua, it looked like it had a fair bit of promise. 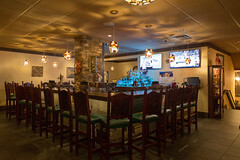 Nashua is actually generally a pretty good town for restaurants, and several places gave the place good marks, so I figured it was worth stopping in. 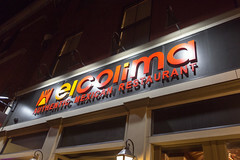 El Colima is a cozy little place, although it’s obviously expanded over its history from a small, single storefront to two, breaking the place up nicely into a cozy dining area, and a larger, more open bar area. Like a lot of non-takeout Mexican places, cocktails are one of the mainstays of the menu, and they’ve got a very good selection of margaritas, margarita variants, and even some good non-alcoholic drinks (indeed, it warms my heart when I see a good jamaica or a horchata on a menu!). 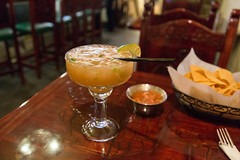 I was soon sitting back and relaxing with a bowl of chips, some very pleasantly-executed house-made fresh salsa, and one of their Level 3 margaritas made with El Jimador Reposado (they’ve got a very granular set of margaritas on the menu, from the simple house margarita, increasing by levels up to the Level 9). I often find that higher-shelf tequila is wasted on margaritas, but not in this case, this was a carefully composed margarita with fresh lime. For my dinner, after looking over many of the options, and being tempted by more than a few of the seafood dishes such as the camarones sarandeados (grilled shrimp in guajillo sauce, which looked splendid at the next table), I ended up going for a fairly simple dish: their steak enchiladas, served up with beans and rice in a traditional mole sauce. I have a weakness for good moles (ahh, I’m now reminded of how much I adore The Red Iguana in SLC), and the version at El Colima did not disappoint: a rich, chocolate heavy and earthy, but distinctly not sweet, mole sauce, this was the perfect covering sauce for a trio of nicely tender bits of steak and cheese wrapped up in some obviously house-made fresh tortillas. I don’t often crave enchiladas, but these were perfection. So, I’m quite happy that I set aside my normal skepticism about New England Mexican places and decided to try out El Colima. They are definitely working into my rotation when I find myself in Nashua again. Okay, I admit, I’m close to running out of breakfast places to review, so I decided to start reviewing some lunch spots on days when I haven’t brought a lunch from home. However, I’m trying to focus on the more unique places, the out-of-the way spots, the locally-owned businesses, the hidden gems, and the good deals. And, most importantly, the places that are close enough to my office and fast enough that I can grab lunch, bring it back to my office in Etna, and eat it at a reasonable pace all within about 45 minutes or so. Today, it was Jake’s Market and Deli on Mechanic Street (a.k.a. the Mobil Station). What brings me to this particular gas station on a Tuesday at lunchtime? Chicken.